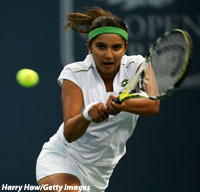 CARSON, Calif. -- Sania Mirza capped a bad day for high seeds in the East West Bank Classic by knocking out No. 7 Martina Hingis, 6-2, 2-6, 6-4, in a second-round match Tuesday night. "You can't let a player like her run away in the first set like that," said Hingis, still bothered by hip and back injuries sustained earlier this season. She said she was physically and mentally tired in the third set while Mirza got fresher. Even so, Hingis rallied from a 40-0 deficit to get to deuce on Mirza's serve in the final game. But Mirza, 20, took advantage of her fourth match point. She sent a forehand into the open court and won when Hingis hit a forehand long. "I think she just went for broke on all the match points," said Mirza, ranked a career-high No. 30. "She made two big forehands, then went for a third one and just missed." Mirza, who had knee surgery earlier in the year, said the key was her play in a three-game stretch early in that final set, when she turned a 2-3 deficit into a 5-3 lead. That put her in position to overcome an attack of nerves and serve out the match. "You're playing Martina Hingis. You can't expect to roll through 6-0 in the third set," Mirza said. Hingis' departure followed earlier second-round losses Tuesday. Wimbledon finalist Marion Bartoli, at No. 6 the highest seed to have played, and No. 8 Dinara Safin were also ushered out. Bartoli, who said she was "flat on the big points," was beaten, 7-6 (2), 6-3 by Maria Kirilenko. Safina lost to Katernya Bondarenko, 6-2, 7-5. Safina had won the previous three matches with Bondarenko, whose older sister Alona had lost on Monday as the No. 14 seed. But the younger Bondarenko said that actually worked in her favor. Earlier Tuesday, Elena Dementieva opened defense of her tournament title with a 6-3, 6-1 victory over Ekaterina Makarova. "I think it was a good start," Dementieva said. "I never played against her [Makarova] and didn't know what to expect. We had a really big fight in the first set, but I easily won the second one and it's good to get some energy for [Wednesday]." Dementieva, who beat Jelena Jankovic in last year's final, came into this event after reaching the semifinals last week at the Acura Classic. The 25-year-old Russian is seeded only ninth because a nine-week layoff due to a right rib stress fracture dropped her out of the top 10 in the WTA Tour rankings. She was No. 8 before she got hurt in mid-February and No. 13 this week. But she said she has fully recovered and is now focusing on this month's US Open. "I think it's about getting your confidence back, playing as many matches as I can before the US Open, to get the good level of the game for the big events," Dementieva said. "I'm just happy it's not bothering me anymore and just looking forward to finding the rhythm of the game and playing better." Dementieva, who won her seventh career title earlier this year, could face No. 5 Daniela Hantuchova in the third round and top seed Maria Sharapova in the quarterfinals. No. 10 seed Shahar Peer and No. 15 Katarina Srebotnik both advanced to the second round with straight-set wins, as did Shaui Peng, Victoria Azarenka, Mara Santangelo and Lilia Osterloh.